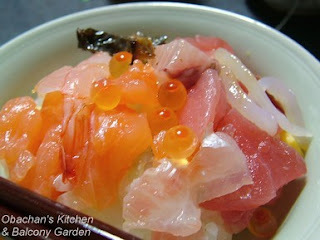 I had chirashi zushi last time I went to my favorit japanese restaurant, and I liked it very much! It had little toasted seeds and bits of nori too. I love hitting supermarkets for bentos around closing time (which is usually about when I get off of work). I once got a Sushi Delux set for 50% off! Made that afternoon! Obachan, that is fancy for store bought! I am impressed too that you got 20% off! Yum! Looks gorgeous! I have never had this dish, but love sushi! Congratulations!! Getting it for such a good prize definitely makes it extra tasty. Ah, nori! 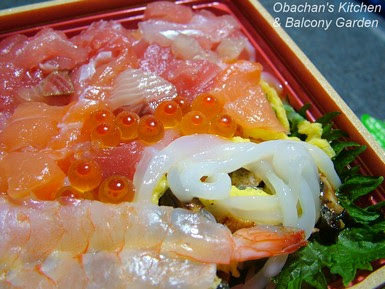 I like it on chirashi zushi, too. Mmmmm…50% off is really good. Lucky you! I crave for sushi about once in two weeks.